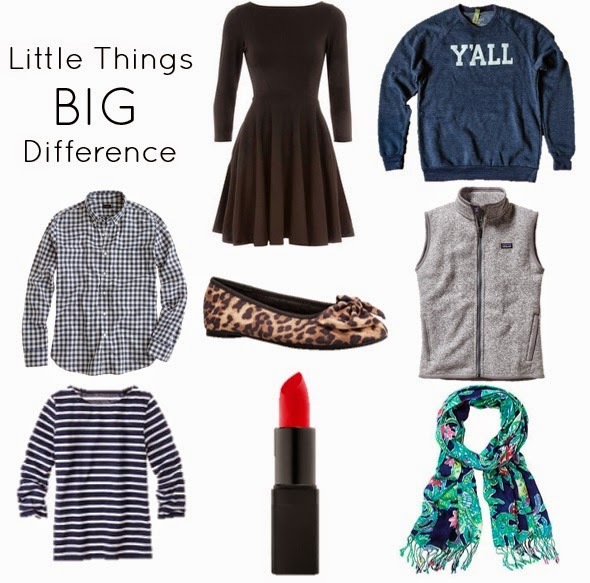 Everyone has those "little things" in their closet that end up making a HUGE impact on their entire wardrobe. It's those things that you wear all the time, and you never get sick of them. Here are my eight "little things" that I wear all the time or are similar to what I wear all the time. Gingham Shirt | Where was I before a I owned a gingham shirt? Probably sad and lonely. During the spring and summer, I probably wear my gingham shirt once a week, and in the fall, it makes its appearances too. It's great to wear with bright skirts and shorts and to layer under sweaters. Striped Shirt | This is pretty much the same as the gingham shirt. It's seriously such a versatile piece, and I wear mine all the time. Maybe too much... Because it's okay because I own four different versions of a striped shirt. Black Dress | Literally everyone of the planet says this, but if you don't own a LBD, you should. Dress it up. Dress it down. Spring. Summer. Fall. Winter. There's always a time for LBD. Leopard Flats | Jenna Lyons said leopard is a neutral. Do I need to say more? Red Lipstick | Taylor Swift wears red lipstick. I wear red lipstick. #twins. But really, red lipstick can and will change your life. Need to feel fancy? Red lips. Sassy? Red lips. Classy? Red lips. Colorful Scarf | In the spring, I wear my favorite J.Crew scarf all the time. It's flowy and colorful, and it's my favorite. Lilly Pulitzer makes some amazing patterns with the Murfee scarves.